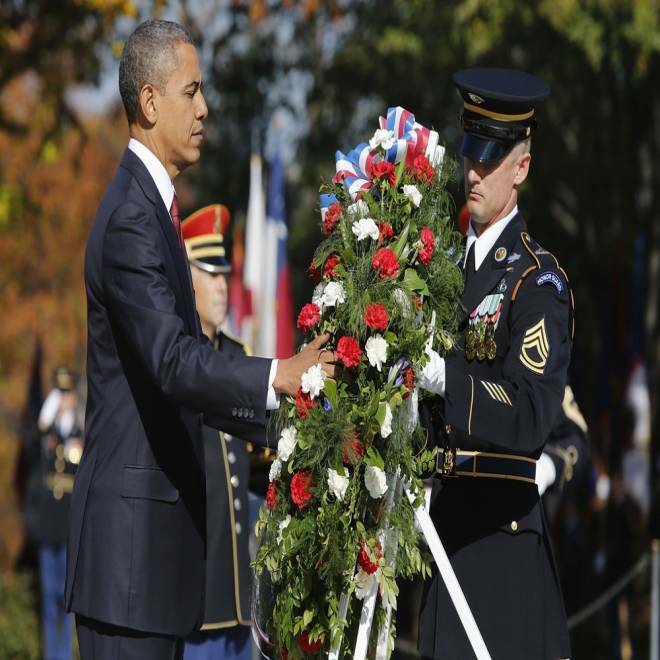 At the Arlington cemetery in Virginia, President Barack Obama paid tribute to veterans. "Each year on the 11th day of the 11th month, we pause as a nation and as a people to pay tribute to you," the president said. NBC's Lester Holt has more. President Barack Obama honored the nation’s military veterans on Sunday, paying tribute at a Veterans Day ceremony at Arlington Memorial Cemetery to "the heroes over the generations who have served this country of ours with distinction." In keeping with tradition, he laid a wreath he laid at Tomb of the Unknowns at Arlington National Cemetery in Arlington, Va., an act he said was intended to "remember every service member who has ever worn our nation's uniform." Obama said in a speech at the cemetery's Memorial Amphitheater that America will never forget the sacrifice made by its veterans and their families. President Barack Obama places a Veterans Day wreath at the Tomb of the Unknowns at Arlington National Cemetery in Arlington, Va., on Sunday. "Whenever America has come under attack, you’ve risen to her defense. Whenever our freedoms have come under assault, you’ve responded with resolve," the president said. "Today, the proud nation expresses our gratitude but we do so mindful that no ceremony or parade, no hug or handshake is enough to truly honor that service." Obama also noted, "This is the first Veterans Day in a decade in which there are no American troops dying and fighting in Iraq" -- a statement that drew polite applause from the crowd. 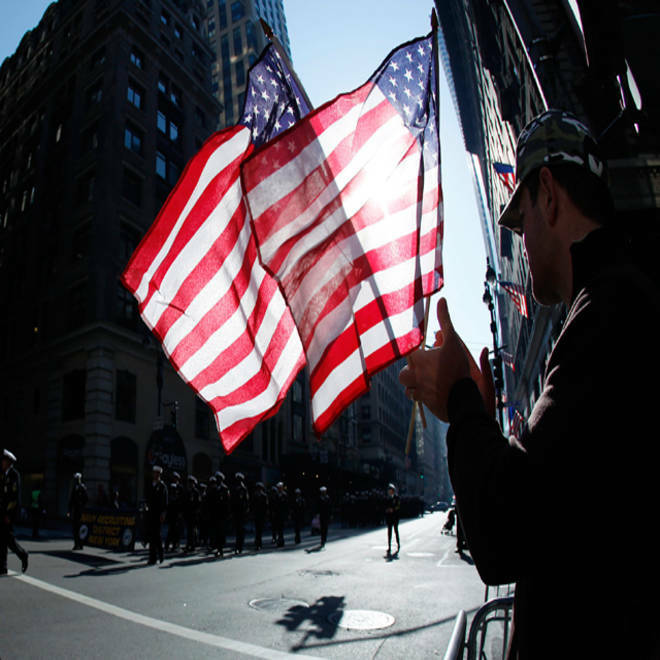 The country expresses its gratitude for veterans and their service with ceremonies and parades. The president touted the work of first l ady Michelle Obama and Jill Biden, wife of Vice President Joe Biden, for their involvement with the Joining Forces campaign, which urges businesses to hire veterans. He also reaffirmed his commitment to continuing the post-9/11 GI Bill program, which provides college education funding for those who have served, and said soldiers suffering war-related health problems will get the care they need. "No one who fights for this country overseas should everhave to fight for a job, or a roof over their head, or the carethat they have earned when they come home,'' he said. After the speech, Obama visited Arlington National Cemetery’s Section 60, the final resting place for the service members who lost their lives during the Iraq and Afghanistan wars. Dozens of family members and individuals were at the area paying respects. The president and first lady talked quietly with some of them. The Associated Press and Reuters contributed to this story.